They rise up all around, some with simple conical tops, others with rocks seemingly balanced on top, and still others with a phallic appearance that is disconcerting in such a conservative country. Almost all of the Fairy Chimneys have an ‘elf door’ or windows carved into them making it seem as though we’ve landed in Smurf-land…only there are no little blue men and women running around (at least I didn’t see any!). They are what is left after the wind, and time, eroded the volcanic landscape in the valleys. The rock is soft, carving is easy and the temperature inside the cave dwellings stays comfortable year round – there is no wondering why people carved into them. 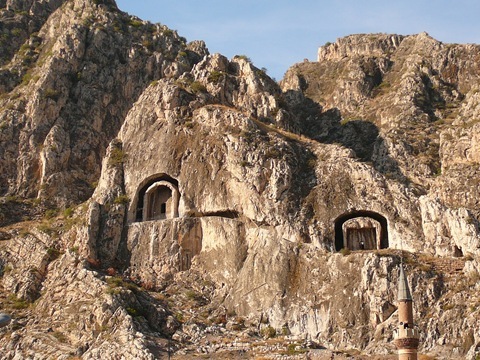 Entire villages are carved into Fairy Chimneys and, in the case of Cavusin, the entire village was carved into one rocky embankment…although the danger of this can be seen where the rock face has given way to reveal the rooms inside. A visit to the Goreme Open Air Museum gave us a chance to look inside some of the cave churches that were ‘built’ during the Byzantine period. 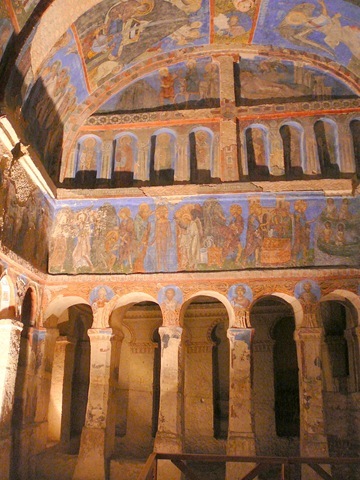 Church after church carved into the formations, complete with apses, columns, arches and frescoes…absolutely amazing! The best way to see the valleys though, is by horseback. 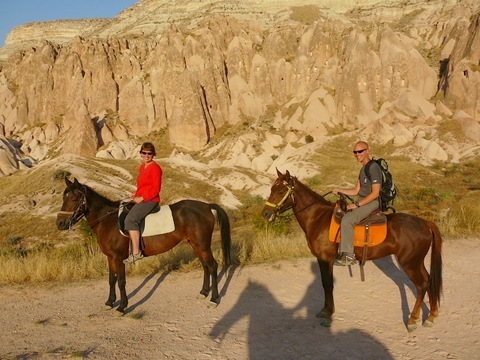 Riding through the formations on an Anatolian horse is like a remembrance of how life was lived here in the past…quietly and simply. We were able to get much farther on horseback than on foot and could see how far the valleys reach. It was a fabulous afternoon. 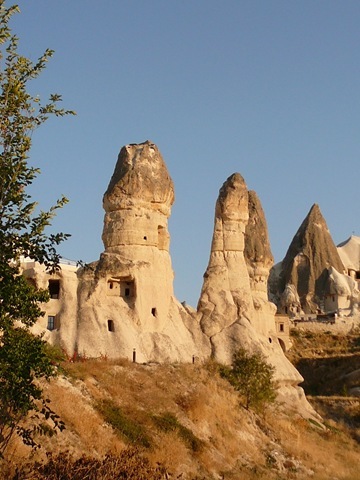 I have been captivated with the thought of Cappadocia ever since a coworker returned from Turkey years ago with pictures of alien landscapes and tales of stunning scenery (Hi Gail!). It certainly didn’t disappoint, and I’m still captivated. 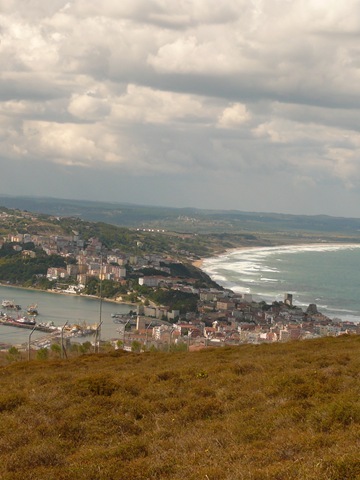 We’re sitting high on a hill on the Sinop peninsula that juts out into the Black Sea. It’s midday and the call to prayer floats up from the town below. I’m getting used to hearing it now but it still sounds ancient and haunting…even more so as I gaze out over the hillsides and villages in the distance imagining this occurring five times a day for centuries. We hadn’t planned on coming to Northern Turkey and the Black Sea coast but circumstances saw us with some time to kill and so…why not. We landed in Istanbul a week ago with only one day to spend before heading to Ankara to secure our India visas at the embassy there. A stroke of luck saw our time here overlapping with friends from home. Lisa and her family are also out traveling the world. It was amazing to catch up with them amid the hustle and bustle of Istanbul. 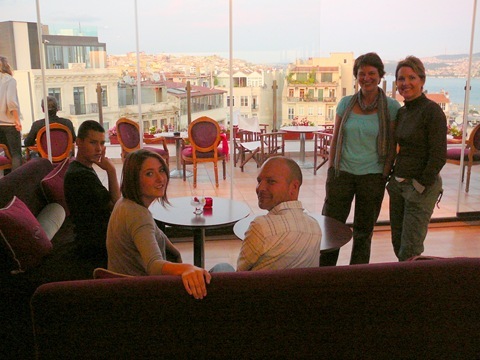 Talking about home and travel under the ancient Galata Tower while sipping raki was surreal. The kids were excited to tell us about their adventures and eager to show us the Istanbul they had discovered in their week here. It was a great afternoon/evening and comforting to see faces from home. The next day we took a comfortable bus to Ankara, the capital city of Turkey. It’s not a tourist destination by any means but the Indian Embassy is located there and we have need for an Indian visa. Our first attempt confirms that we do not yet have all the pieces we need and so we spend the afternoon arranging for flights into, and out of, India. It seems strange to have to purchase flights into and out of a country that we are not yet allowed into and yet there is no other way. We will just hope that it all turns out as it should. A further issue unfolds when the man behind the gate tells us the visa will be ready in 10 days. Ten days? We had thought it would take four and, as even that was a long time to spend in Ankara so we had planned on heading to our eastern most point for that time. But 10 days was even too much for that. And so, with flexibility and spontaneity being our guide, we pulled out the map and thought that the northern coast might be a good place to cool our heels. As we move north, through Kastamonu and Boyabat, the culture becomes more conservative. We had seen plenty of women in headscarves, and an abundance of men in the cafes, salons and restaurants in Ankara, but in these places it was even more pronounced. In Boyabat we saw very few women out at all, and certainly not in any of the restaurants so, for lunch,we settled on a bag of chips and a Pepsi in the bus station as we waiting for our onward bus. We talked about how much more conservative it might be as we moved even further north but we wanted to see the landscape and reach the Black Sea coast so we pressed on. We would manage the culture, and our lack of language, as best we could. Sinop surprised us and proved to be a very relaxed, cosmopolitan, port town. The restaurants and cafes that line the harbor still have men outnumbering women, but there are women and they are not all covered and sipping tea…some are actually enjoying a beer! I still feel more comfortable when I am covered completely (long pants and sleeves…covering my hair would be inappropriate as a western woman, except when in a mosque), and I ensure that I don’t meet the gaze of men, but I like it and don’t feel so much of an intrusion. We are still stared at though as we are definitely the only western tourists here, but people are more than friendly…we only need to look confused for 5 seconds and invariably someone will ask where we are trying to go! School children we pass practice their ‘hello’ (and some practice the other dirty English words they have been taught…I wonder if they know what f*ck you means? ), and, although most people don’t speak any English, they are more than happy to read the questions I write out in Turkish and pantomime a response. Coming to the north has been an exercise in flexibility, culture and tolerance. The landscape has been stunning, the history too deep to imagine, and the people are kind. I’m glad that India’s slowness prompted us to get off the beaten track and explore a region that we would have overlooked otherwise.